"From hero to zero", "stripped of" and "first woman leading"
Obama's staged arrest, stripped of titles and sentenced to death by SCOTUS, with Hillary Clinton proclaimed the real 44th president, successor of GW Bush. Not only first woman president but also ensuring BushClinton as president since 1992. All this before Hitlery would finally win a "legit election" from begin to end, with a result even more impossible than the 43-8 of Superbowl 48: her real polls are 2%. Unlike some of the participants in the first and second series, probably none of the women in the third series was forced to appear in the cast. As always each episode also advances specific agendas, from setting the stage for manhunt for non-whites to marketing the hoax "champions of natural sports dope". Examples - From Politics to Sports, not to mention the named shows: business and reality. Politics: Trump, paving the way for Clinton, in the most stunning suiicide jump off the window that the republican party's tower has ever seen. Cruz, same as Rubio, additionally to set the stage for the manhunt for latinos. Sports: Peyton Manning Superbowl 2014, Tom Brady following the Superbowl 2015, Cam Newton Superbowl 2016. Lance Armstrong, greatest cyclist ever. Coming: Usain Bolt, fastest man ever and forever; Lionel Messi, greatest football player ever. ALL Russian, Kenyan and Ethiopian athletics champions, going as far as all banned from competing for global titles justified as "just because of nationality", more precisely at the Rio Olympics. Reality shows: Cesar Millan, 'Dog Whisperer' faces cruelty probe, set the stage for the manhunt for latinos. Sports: Lance Armstrong, Tour de France seven times. Coming: Usain Bolt, world records, titles. Not only Tom Brady and the Patriots but also Peyton Manning and the Broncos from their Superbowl titles and beyond: the NFL books stripped from the Superbowl 2016. Peyton Manning 2014 as loser part of "hero to zero" while 2016, as winner, part of the coming "stripped of". On the other hand Tom Brady both times related to 2015: first "hero to zero" alias "deflategate scandal" before the coming "stripped of". Superbowl 2016, stripped from the books. The Seattle Seahawks will be declared the very last champions, winners not only in 2014 but also in 2015. In other words: the Superbowl 2016 will be declared a sCam, null and void,. Russia and Qatar, stripped from hosting the Football World Cup 2018 and 2022. As for show business and reality shows: the mixed act "Trump strips Miss California from her crown", explained 2009 by Last Prophet. Last Prophet explained in 2004 Lance Armstrong "confession" of Jan 2013, after being tortured for years. There is no difference between the actress Prejean in the role of "Miss California stripped of her crown" (2) and the actor in the role of "President Obama stripped of his presidency". Before "Miss California" was "elected", Prejean already knew she was going to be stripped of her crown. From "Where the name Trump comes from", Feb 2014: Fake identity Trump is yet another actor casted in the "from hero to zero" series, from "Super Trump" to Supertramp. Below a musical introduction to that article: contrast "the Lady is a Tramp" (Dec 2015) with keeping Supertramp out of Super Trump (added Sep 2016). Who blows Last Trumpe(nce)ts with Trump? Literally casted "Mike Pence" seems the obvious answer. But this article reveals other musicians also casted in trumpet duets with Trump. "Hispanic Cruz" was named after the word cross: his role is to be crucified while playing his suicide bomber role, paving the way to let "billionaire Trump" start the manhunt for all hispanics. The supposedly to be "deported" illegals will be the first to be gassed in the FEMA camps. Illuminati are now openly marketing the ongoing genocide of elderly, women and children, using the "polls" psy-op technque: "Trump's popularity rises after Trump calls for US military to kill families of ISIS". Talk of "polls": that's all it takes to have the human cattle believe that Hillary Clinton, who 98% of americans can't stand, is in a "head to head race with Trump". 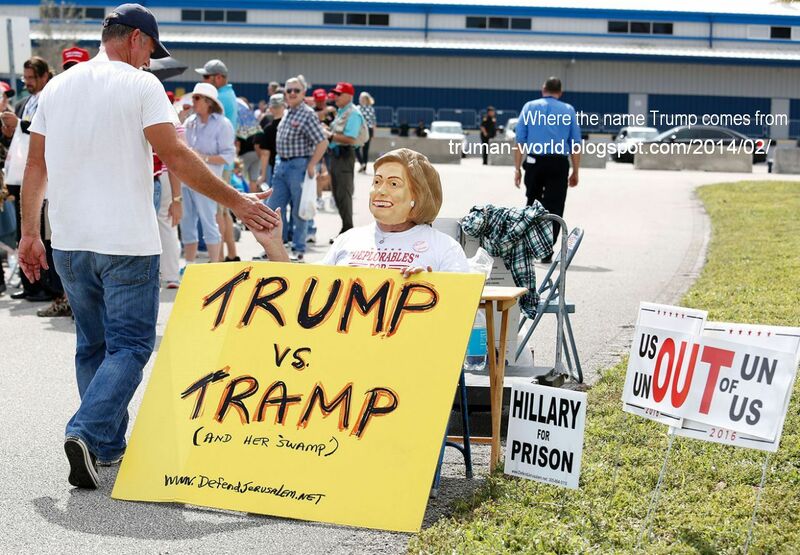 Talk of Clinton: human cattle will not only refuse to admit that the word Tramp was one of the reasons for naming Trump but actually buy the illuminati joke of having both words in the same poster at a pro-Trump rally. All it takes is to switch the soundtrack to "a spoof of New York high society" (in wikipedia's words) : not Trump but "the lady is a tramp". "'Super Trump' lands in Times Square - A pro-Trump group has unveiled a 16.7m (55ft) billboard in NYC's Times Square". At first sight this is yet another proof that there are no limits to what lengths illuminati will go to mock the cattle, thanks to total control of media. In other words: serving this as "serious pro-Trump propaganda" resumes to keep the supertramp word out of the "report", as illustrated by those "interviewed" by BBC "news". Yet this mockery is not perfect: the super duet, Trump and Tramp, is only suggested not explicit as in "the Lady is a tramp" poster version. Actor playing billionaire named after the verb (to trump) as well as similar nouns: Tramp, Trumpet (Last) and Truman (Show). Trump, same as all other billionaires fed to the human cattle, doesn't own any of the jewels of his empire. "Patriot('s) Tom Brady" casted as illuminati icon who will now fully detonate. The act "very last Superbowl" had already to be postponed again and again. Seattle Seahawks alias the superb owl hidden in plain sight, will be proclaimed "the real very last champions in 2014", everyone else ever since stripped of their titles. Mexico's minister of Economy Villareal arrived in New York for "NAFTA negotiations" just after Trump's inauguration while extradited El Chapo supposedly arrived at the same city just before the same act. FULL STORY behind these headlines was exposed long ago and worldwide only by one. Last edited by TruthIsNeverTooHorrible; 03-03-2017 at 06:22 PM. FIFA arrests scandal: theater before the coming "Blatter arrested and stripped, Russia 2018 Qatar 2022 stripped of World Cup"